On instagram we posted photos of some really amazing gifts that we got during finals week, which totally cheered us up! Here are some of the pieces finally styled! i love you both girl's outfits! super chic and fun! That galaxy dress is amazing! Ah, you both look amazing! So much pretty in this post! I am in LOVE with Whitney's look here, I want to steal the whole thing (I love those Zara shoes so much, if only we had a Zara here!) and the galaxy dress is so fun on Mallory! oooooo loving the galaxy dress!! You girls have awesome stuff! Gorgeous outfits! I love the details on each. Man, you girls kill me with all your outfits! I'm loving that chic blouse and sparkly clutch Whitney. And Mallory, that dress has been on my wish list forever! IN LOVE! I need that galaxy dress and that shiny clutch!! I am jealous! Congratulations again for the both of you graduating! 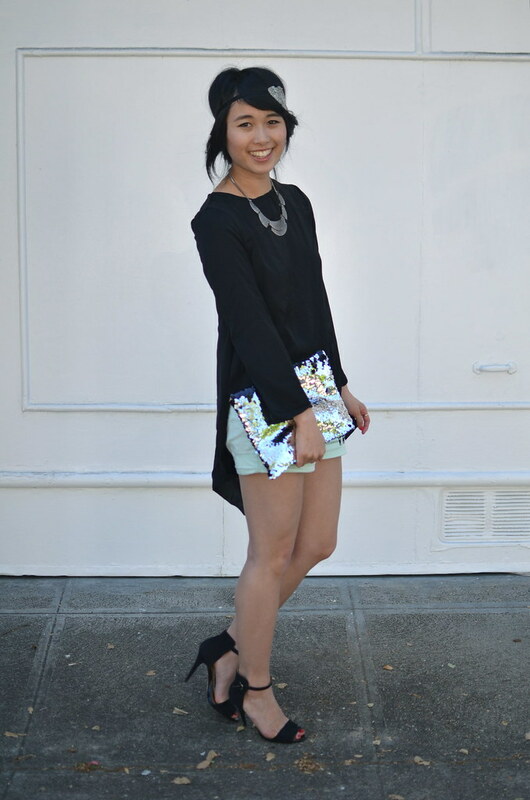 I love these two outfits and the DIY clutch! Mallory's dress is gorgeous! Congrats on finishing finals! Love Mallory's dress and love Whitney's top! Congratulations on graduation and finishing up your finals! That galaxy print dress is so super cool. 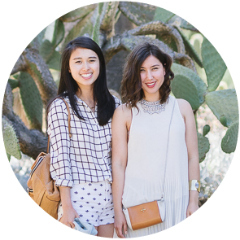 I really love the high-low hems in both of your outfits. You both look amazing, but I'm really obsessed with that galaxy dress!! also! Congrats on graduating from Cal!! Wow great outfits! The dress is so beautiful! And love your shorts! that galaxy dress is super cool! so neat. love how it's short at the front, long at the back. You two look so great! Galaxy prints are on my lust list right now, as are open backs...fab, fab, fab! Oh, thanks for visiting our blog :)we hope you liked it enough to stop by often in the future! Both of your outfits looks great, I especially adore the shoes !! Agh I want that galaxy dress SO bad! wowza, i love your outfits, ladies!!! i'm always into shorts and that necklace with that gorgeous clutch is perfection! and that galaxy dress is just amazing! You both look very good! I really love the galaxy dress! WOW! 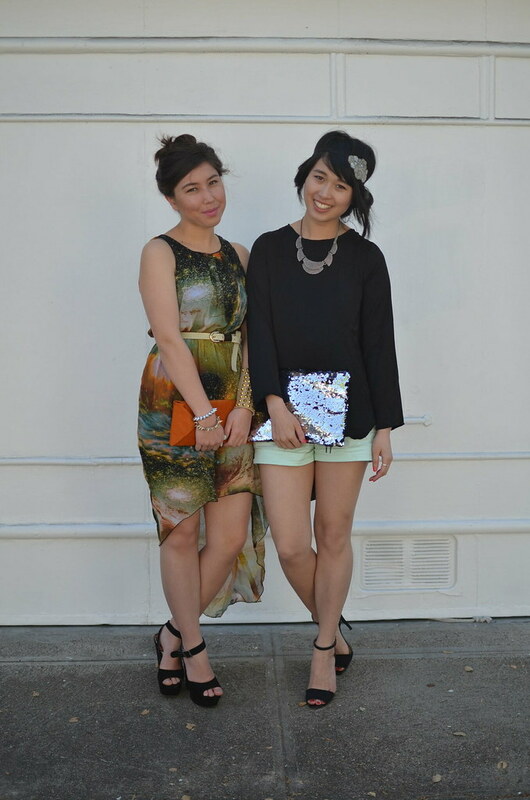 You girls are fabulously stylish! LOVE it! Gorgeous! The black open back tunic and the galaxy dress are so pretty on you both! Love the accessories, too!